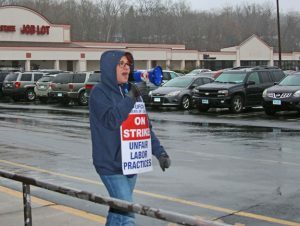 NAUGATUCK — Thirty-one thousand Stop & Shop employees at 249 stores across three states, including one in Naugatuck, went on strike Thursday afternoon. The Stop & Shop at 727 Rubber Ave. in Naugatuck was open Friday morning, but practically empty, as employees picketed at both entrances to the store. Inside the store, the cash registers were almost all unmanned. Anyone who wanted to check out had to use one of the self-checkout registers. Chants of “hey hey, ho ho, corporate greed has got to go” could be heard across the parking lot. “No one wants to be out here, but we have to do what we have to do,” said Loralee Begin as she picketed outside of the Naugatuck store with fellow employees. The grocery retailer stands to lose out on lucrative Easter holiday shopping if the strike isn’t resolved soon. According to the National Retail Federation, in 2017 Americans spent $5.8 billion on food, $2.6 billion on candy and $3.3 billion on decorations and flowers ahead of the holiday. The retailer said it has “proposed a good and reasonable offer to our local unions” that includes across the board pay increases for all associates, continued health care benefits at a fraction of what employees at other retail companies pay and increased pension payments to full and part time UFCW members. UFCW spokesman Abraham White said store closures will be decided by managers at each location. Workers from five United Food & Commercial Workers in Connecticut, Massachusetts and Rhode Island have been in negotiations with Stop & Shop’s Dutch parent company Ahold Delhaize since Jan. 14. The parties have been at odds over proposed reduced wages, stripped-down benefits packages and pension plans that would reduce employer contributions and raise costs for workers. Also at issue is Stop & Shop’s intention to eliminate more cashiers in favor of checkout machines. “They want to take our pension. They want to give us bonuses and not raises. Take away overtime. Increase our medical. Eliminate vacation time. Cut holidays and personal days, sick days. You name it, they want it all,” said Begin, adding it’s the employees who are the foundation the company is built on. Ahold Delhaize’s 2018 earnings report, published Feb. 27, pushed the two parties further apart when it revealed $1.8 billion in net profits. On March 10, 600 of the 7,000 Stop & Shop workers represented by UFCW Local 919 attended a strike authorization meeting and voted unanimously to approve a strike, making it the fifth and final local to do so. Local 919 represents front-end Stop & Shop workers in Connecticut, including in stores in Waterbury, Naugatuck, Watertown, Cheshire, Torrington, Litchfield, North Canaan, Southbury and Winsted. Local 371, which represents back-end workers in many of the same stores, authorized a strike on March 6. Locals 328, 1445 and 1459 in Massachusetts and Rhode Island had previously authorized strikes. U.S. Sen. Christopher S. Murphy, D-Conn., on Thursday expressed his support for the striking workers in a statement.